With GoToMeeting, “Meeting is Believing.” Sign up for a free 30 day trial. Visit GoToMeeting.com and click the “TRY IT FREE” button. 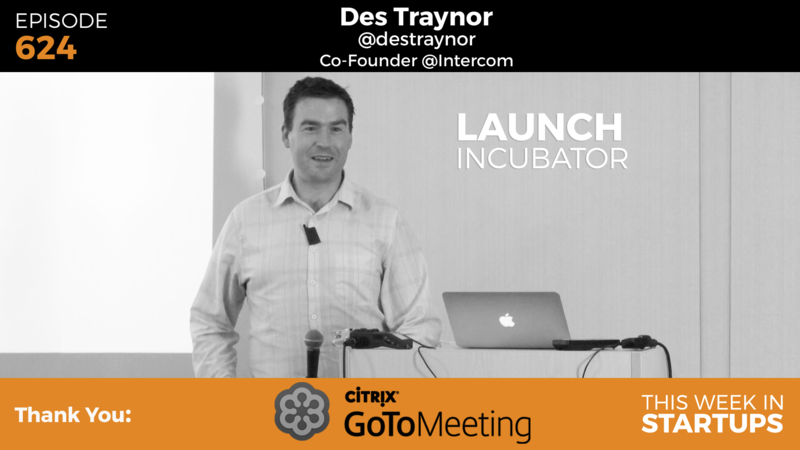 In episode 624 of This Week in Startups, Intercom cofounder Des Traynor returns to the LAUNCH Incubator with another powerhouse talk. “Thinking Through the Funnel,” Des leads founders through different issues they should consider when trying to acquire users. Des lays a foundation by saying that most companies have no difficulty getting their first hundred, thousand, or sometimes even million users; it’s keeping those users that is the truly challenging task for companies. Read on for a quick walkthrough of the four main steps of getting — and keeping — users. Des says that in order to successfully keep users, you need to do more than just convince them to try your new technology or beautifully designed product: you need to communicate that you’ll help them “get the job done,” whatever job that may be. In order to successfully do this, you have to talk to the customer — yes, even the founder should have experience talking directly with your target users. When you hear their needs, wants, and desires directly, you’ll be able to figure out how to create and position your product to help them with whatever job they need to do. Des defines onboarding as anything that occurs from between expressing an intent to use the product, and when they are actually fully able to use it. He says most founders and companies design an onboarding program, then forget about it. Within reason, each time there is a major change in your product, you should go back to your onboarding process and ensure it still adequately helps get the customer to being able to successfully use the product. Sometimes, this can be done through optimizing the page (making small adjustments), but often, it requires a redesign of at least some components. If you think your product doesn’t have a trial period, Des says you’re wrong. Every product has a trial: every user has their own trial period to determine if the product or service provides them value. This is an important time to communicate with and support your users (and it’s why drip email campaigns have become an integral part of early communications strategies). This is also an important time to be soliciting feedback from your new customers: whether or not they are finding value, you need to understand why, and improve what you can. After a user successfully moves out of a trial phase, your work is not done. It’s still important to watch what users do next: Do they churn? Do they stop using after a few weeks and go try a competitor instead? Do they stop using but continue paying you? Des says that you can’t stop talking to the customer just because they have become a full-fledged user: you need to observe and communicate with them in an ongoing way, to ensure you understand how to continue providing them the value they found when they first started using your product. Want to hear the whole presentation? The full episode with Des Traynor, as well as past episodes are all available on This Week in Startups. 9:30–12:40: Des discusses what you should focus on as an entrepreneur, and the fact that you have to talk to customers. He also provides insight from Intercom as an example. 12:40–15:18: Des discusses the definition and process of onboarding, and why onboarding should be a constantly evolving experience. 15:18–22:16: Des lays out the differences between optimizing and redesigning, and where your focus should be depending on how your product is performing. 22:16–28:05: Des explores the ideal of a product trial and how it all comes back to how much value customers see in your product and how you can segment users to enhance this perceived value. 28:05–32:33: Des explores how to think about keeping your product valuable and learning from customers about customer retention. 32:48–37:31: Jason asks Des about the art of knowing when to listen and when to ignore the information your customers give you about your product. 31:33–41:14: Des answers Jason’s questions about about how to prioritize feature development, measuring and predicting the impact of those developments, and how the founder balances these dynamics. 41:14–44:25: Jason asks Des about how to balance “data-driven” versus “gut-driven” decision making as a founder. Des also lays out the 5 inputs he balances in product development at Intercom: what they want to build, what can be scaled, product quality, bug bashing, and product iteration. 44:34–47:44: Des answers Jason’s question about what one thing he would have changed earlier as a founder, as well as how long Des thinks it takes a startup to know it’s time to prioritize a growth team. 48:43–49:50: An audience member asks Des about “signing up for your own product” and Des gives insight into the rational behind that advice. 51:47–55:40: An audience member asks about the different kinds of investments to make in growth, and Des talks about “growth hacking” and his growth priorities as a founder. Des and Jason discuss Peach and Secret as an example. 55:40–59:10 : Jason and Des talk about how investor perceptions of growth have changed in the past few years.